Quality and craftsmanship.... We use solid hardwood for our furniture tops and faces, typically finished with a hand-rubbed oil finish. We do this so that, if an accident happens, the problem can be fixed by simply sanding down through the problem area and reapplying the oil finish. Try doing that on a veneer top; the repair often requires replacing the whole piece. Many shops, including large home improvement stores, offer cabinets with hardwood door and drawer fronts, but then skimp on the internal casework by using particle board or multi-density fiber (MDF). This saves money, but reduces both strength and durability. We have repaired many cabinets where particle board or MDF hangers were used to mount cabinets to a wall and subsequently let loose. We use only solid hardwood for our structural hangers. For our cabinets and casework, we do not use particle board, MDF, or any other glued-up sawdust or stranded material. All internal components are made of hardwood or high-quality plywood. As for hinges and drawer tracks, we use top quality ball-bearing side-mounted drawer tracks, and offer self-closing and soft-closing drawer slides. 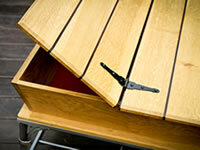 What all this comes down to is that we construct cabinets and furniture that are beautiful, strong, and built to last. Our pricing is reasonable, and our quality is exceptional.